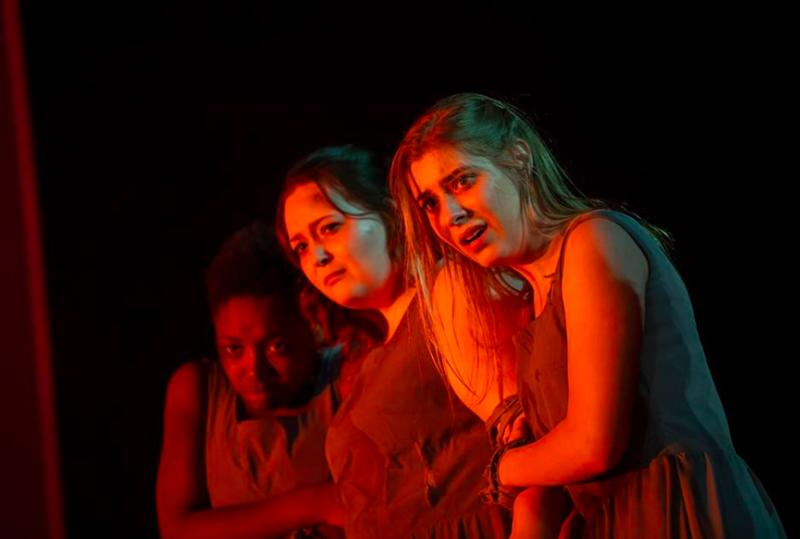 This weekend’s Trojan Women captured the atrocities of war and the women left behind who perhaps suffered the greatest impact. Directed by Caroline Good, this moving performance encapsulated tragedies of war such as death, displacement, and irreparable destruction. 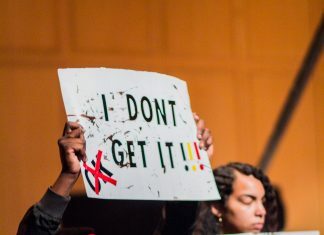 Scene by scene, multiple women bore witness to what they endured. 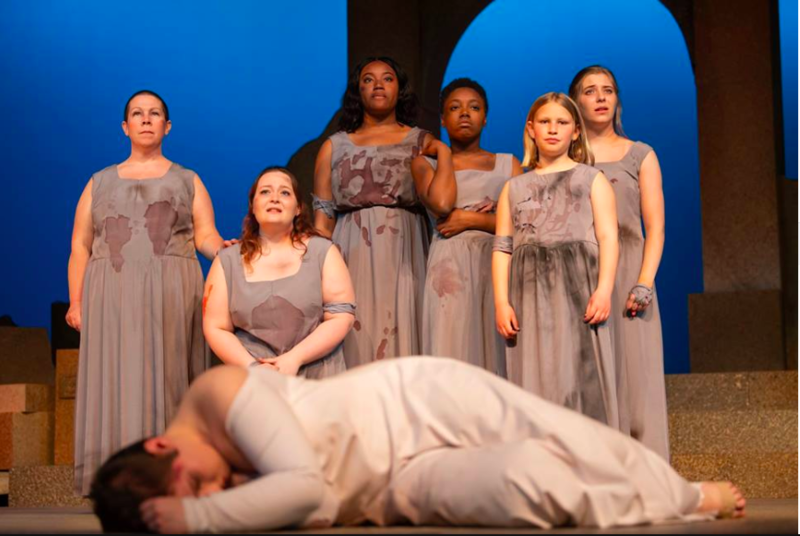 Queen Hecuba mourns her fate of slavery after her husband is killed and home demolished. Helen of Troy suffers retribution from the other women for her choice to elope with Troy and causing the war. Cassandra, with her ability to see into the future, mourns her inevitable future of being mastered as a concubine. Each testimony of pain was memorable as well as disheartening. The agony of the group of women who drove the plot was palpable and often difficult to watch. In one scene, the women watch in horror when their beloved city falls to ruins in the distance as booms and crackling of flames can be heard. Separately, the female characters signify each woman’s internal battle to find meaning in the madness and yet together, they prove the strength of women to persevere matter the circumstances. Although the story takes place during the Trojan War, it alluded to many of the same consequences of modern warfare. For example, the male soldiers wore green camouflage uniforms and combat boots typical of today. 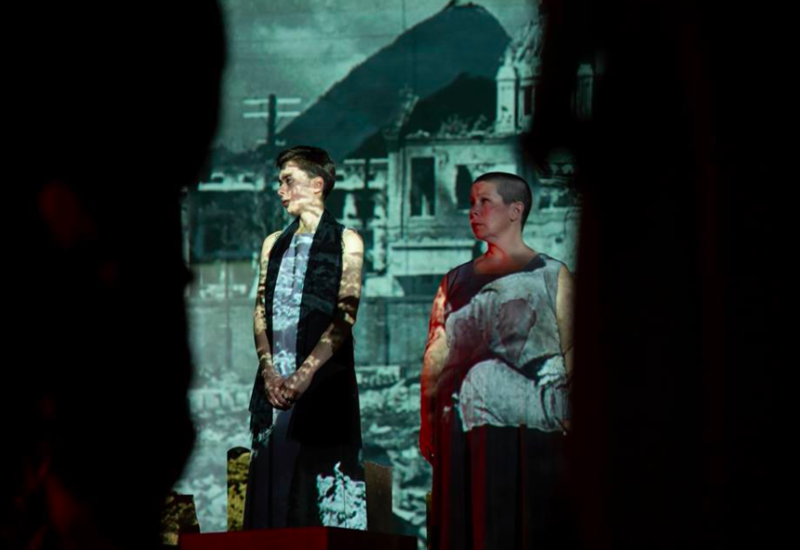 Before and after the performance, photography of historical wars flashed across the stage and the actor’s faces. The conclusion of this play left much to be contemplated in regards to humanity’s role in utter self-destruction.